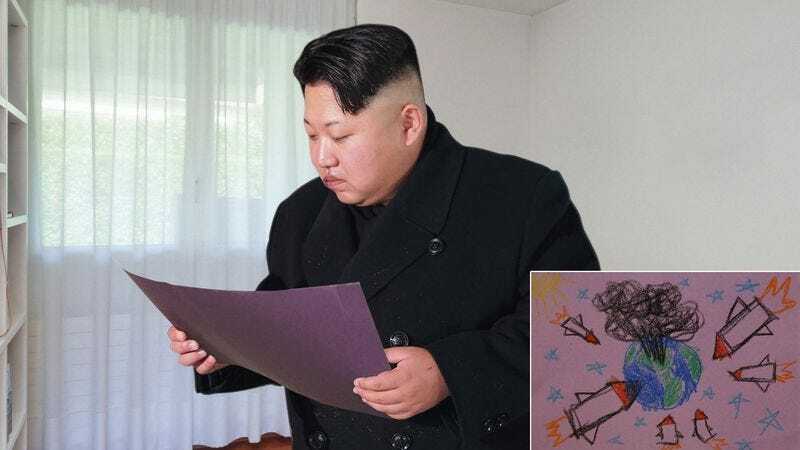 PYONGYANG—Experiencing a deep sense of nostalgia while sifting through the stack of old papers, North Korean supreme leader Kim Jong-un reportedly stumbled onto childhood drawings Monday that he had made of nuclear attacks on the West. “Gosh, time really flies, but I can still clearly remember drawing these pictures of an all-out nuclear strike on the West when I was in kindergarten,” said the wistful Kim, chuckling at the crudely rendered crayon depiction of several nuclear missiles flying toward what appeared to be the landmass of North America. “These nukes are about half the size of the United States, and there’s definitely not enough mushroom clouds. I used to entertain myself for hours by drawing bombs destroying American cities. Aw, I love this one where all the little stick-figure people are screaming.” At press time, North Korea’s state-run media was circulating the childhood drawings as proof of their Dear Leader’s prescience.